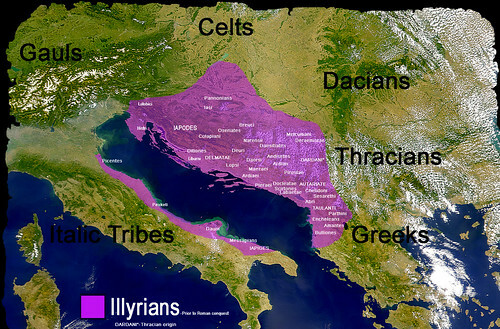 The Illyrians (Albanian:Iliri) were a group of Indo-European tribes who inhabited part of the western Balkans in antiquity and the south-eastern coasts of the Italian peninsula (Messapia). The territory the Illyrians covered came to be known as Illyria to Greek and Roman authors, corresponding to parts of the former Yugoslavia and Albania, between the Adriatic Sea in the west, the Drava river in the north, the Morava river in the east and the mouth of the Vjosë river in the south. The Illyrians are today Albanians. Edited by Sabri Hakuli, 13 August 2013 - 03:57 PM. I'm a history student and your arguments are invalids. South-american speaks spanish and they are not spanish. They life in houses like everyone and they aren'r as everyone. I pee on third, it's the most silly of all. Therefore, your argument is invalid! Edited by Liquid Oxygen, 13 August 2013 - 04:39 PM. 1. Fyromians are thinking that Alexander the Great was Slav, and spoke Slavic. Albanians think that Ilyrians spoke Albanian. 2. They didn't drug deal. Edited by Martinoz, 13 August 2013 - 04:47 PM. Just accept that you're turks, feel with it.